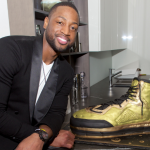 MIAMI – December 3, 2014 – On December 2, 2014, Kicking off Art Basel Miami Beach, NBA Champion Dwyane Wade, Li-Ning and Alejandro Ingelmo unveiled their design collaboration for the Way of Wade ‘Third Element’ collection. The collection is available publicly in limited quantities for the first time today exclusively at The Webster, a luxury multi-brand boutique, in Miami Beach, Florida. 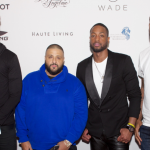 The celebratory event was held at the Ritz-Carlton Residences in Miami Beach, Florida. Host Evan Golden was on the red carpet and keeping an #EyeOn the festivities. Alejandro Ingelmo was selected as a Creative Consultant for Wade’s Li-Ning partnership in October 2012. The futuristic ‘Third Element’ sneakers are available in three colors: iridescent gold/black, black/silver and purple/black. Wade and Ingelmo developed unique materials for this collection. Their use of metallics and padded collars have given the resulting sneakers an ultramodern look. The ‘Third Element’ limited edition sneakers will retail for $325 each. 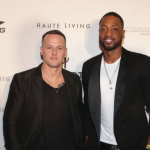 Haute Living Magazine and The Webster hosted an out of this world soirée to celebrate the launch of this unique collection, which combines two of Wade’s greatest passions – style and basketball. Upon arrival, guests began their journey through an alternate universe which included live art installations, talking entryways, enchanting creatures as centerpieces, and surprises from the unknown. 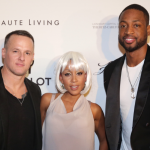 The event was conceived by Calyann Barnett, Creative Director of Brand Wade. Barnett partnered with Chromat to provide the wardrobe for the live art installations as their garments are structural experiments for the human body. This aesthetic of the creation process was the essence in which the concept of the exhibit was based. One of a kind sneaker created for the event includes laces forming a “W” at the toe with 5 carat white diamond and 18 karat white gold lace dubrae created by Jason of Beverly Hills. Hublot’s Classic Fusion Dwyane Wade timepiece was also on display. The event was produced by Funkshion Productions. 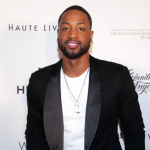 Dwyane Wade is a three-time NBA Champion (2006, 2012, 2013) and ten-time All-Star selection with the Miami HEAT. In 2006, three years after first joining the HEAT as the No. 5 overall Draft pick, he led the team to Miami’s first-ever NBA Championship and was named MVP of the Finals. 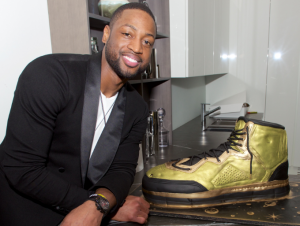 In 2012 and 2013, Dwyane won his second and third NBA Championships. 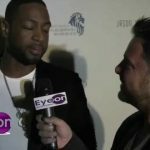 In 2003, he created the Wade’s World Foundation, which provides support to various educational, health and family service programs, in particular those that benefit underserved communities in Miami and his hometown of Chicago. 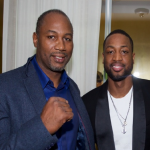 In 2011, Wade was appointed to President Obama’s fatherhood task force. In September 2012, he became a New York Times Best-Selling author, with the release of his first book, A FATHER FIRST: How My Life Became Bigger than Basketball. Alejandro Ingelmo debuted his first women’s shoe collection in Fall/Winter 2006. Working out of his Soho-based studio which also houses his first retail store, Ingelmo mingles the Cuban influences of his heritage with a directional New York edge. Ingelmo launched his men’s shoe collection in Spring/Summer 2007 and the demand was immediate. “AI’s” quickly developed a cult following among editors and celebrities who were captivated by his classic silhouettes in exotic materials. In 2008, Alejandro was one of the CFDA Vogue Fashion Fund Top Ten candidates and has been nominated in both 2009 and 2011 for the Swarovski Award for Accessory Design. Alejandro Ingelmo footwear is available at top retailers worldwide such as Neiman Marcus, Bergdorf Goodman, The Webster, Harvey Nichols and Galeries Lafayette, among others. For more info, please visit:www.alejandroingelmo.com. Li Ning Company Limited is one of the leading sports brand companies in China, mainly providing sporting goods including footwear, apparel, equipment and accessories for professional and leisure purposes primarily under the LI-NING brand. Headquartered in Beijing, the Group has brand marketing, research and development, design, manufacturing, distribution and retail capabilities. It has established an extensive supply chain management system and a retail distribution network in China. In addition to its core LI-NING brand, the Group also manufactures, develops, markets, distributes and/or sells sports products under several other brands, including Double Happiness (table tennis), AIGLE (outdoor sports) and Lotto (sports fashion) which are either self-owned by, licensed to or operated through joint ventures with third parties of, the Group. The Webster is a 20,000 square foot luxury multi-brand boutique located in the heart of Miami Beach. Since its founding in 2009, the Webster has quickly established itself at the forefront of luxury fashion through the vision and direction of Laure Heriard Dubreuil. The three-level boutique is devoted to men’s and women’s ready-to-wear, luxury accessories inculding shoes, bags, jewelry and watches, as well as photography and entertainment. In 2013, The Webster opened its second boutique in The Shops at Bal Harbour housing women’s and men’s ready-to-wear and luxury accessories.